We think there’s a pretty good chance that anyone who actually reads our columns knows that we love, love, love clothes, and that we think you should love them, too. However, we realize that your resources may be better spent on other things, so why not make them go farther when you decide to use them? Help other people while you shop by doing a bit of research or following our philanthropic guidelines. --HIV/AIDS Research: There are many ways to show your support, like a simple red ribbon, but perhaps the most popular clothing brand dedicated to raising awareness is The Gap’s Product RED. 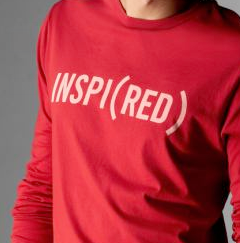 Product RED is a line of tees printed with empowering statements which end in ‘red’, like “inspired” or “cultured”. These comfy graphic tees are made of African cotton and 50 percent of the profits go to drug research. --Have too many t-shirts? MAC is running a campaign with two of their new lipsticks, the “Viva Glam Gaga Lipstick” and the “Viva Glam Cyndi Lipstick.” Some of the proceeds from purchases of the pink and red lipstick shades, go to the MAC AIDS Fund to support men, women and children who are affected by AIDS and HIV globally. Check out http://www.macaidsfund.org/ for more information. --Recycling: You knew this was coming. There are countless recycling projects across the country, and fortunately, you can contribute and benefit with minimal effort and cost. Coca-Cola Drink 2 Wear shirts, made from recycled Coke bottles, are available at Wal-mart. Freecycle.com is a website dedicated to recycling gently used goods by allowing individuals to post them and others to pick them up. Additionally, several outfitters offer handbags made of recyclables. It’s even easier to go local in Farmville. Madeline’s House is a thrift store across from Wilck’s Lake and the proceeds go to a shelter for abused women and children. December isn’t the only time to think of good will toward men and women. These are easy ways to make it part of your spending sprees. Spiderman, hipsters and pants, oh my!